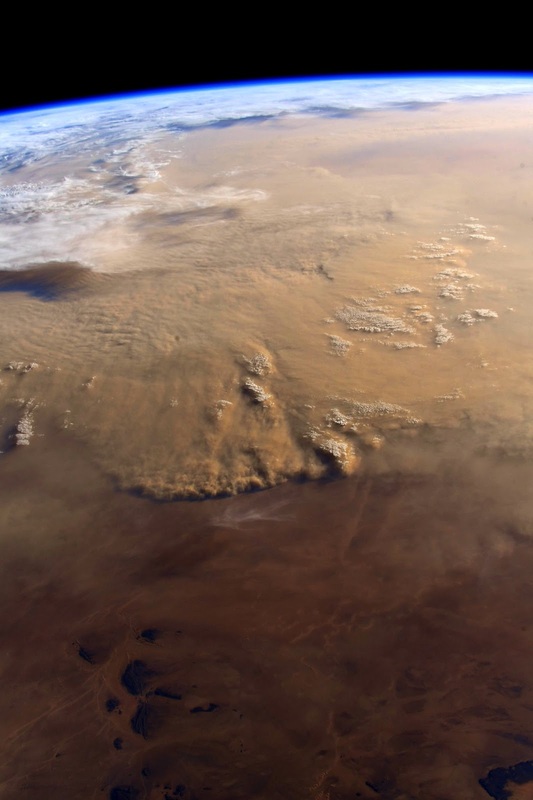 U.S. Astronaut Ricky Arnold: "A massive sandstorm rolls across the Sahara." The Sahara is the largest hot desert and the third largest desert in the world after Antarctica and the Arctic. Its area of 9,200,000 square kilometers (3,600,000 sq mi) is comparable to the area of China or the United States. The name 'Sahara' is derived from a dialectal Arabic word for "desert", ṣaḥra. The desert comprises much of North Africa, excluding the fertile region on the Mediterranean Sea coast, the Atlas Mountains of the Maghreb, and the Nile Valley in Egypt and Sudan. It stretches from the Red Sea in the east and the Mediterranean in the north to the Atlantic Ocean in the west, where the landscape gradually changes from desert to coastal plains. To the south, it is bounded by the Sahel, a belt of semi-arid tropical savanna around the Niger River valley and the Sudan Region of Sub-Saharan Africa. The Sahara can be divided into several regions including: the western Sahara, the central Ahaggar Mountains, the Tibesti Mountains, the Aïr Mountains, the Ténéré desert, and the Libyan Desert. How Big is the International Space Station? Happy 4th of July from NASA!